3/5 Night Short Breaks available please ask the owners for details. The picturesque village of Bretforton is situated on the very edge of the Cotswolds providing an ideal base for exploring the picturesque towns and villages in the North Cotswolds and the historic towns of Stratford upon Avon, Warwick, Cheltenham and Worcester. Bretforton recently featured on 'Village of the Year' Channel 4 TV series in January 2018. Bear's Cottage is an enchanting 17th Century Cotswold Cottage, originally built in 1605 and once formed part of the rectory on the Bretforton Manor Estate. Situated within the Conservation Area of Bretforton and adjacent to Bretforton Manor the cottage paints a tranquil picture overlooking the beautiful 13th Century Church of St. Leonards. Newly renovated and finished to a high standard throughout, the cottage provides charming accommodation comprising of : two double bedrooms each with a comfortable double bedstead and a Millbrook mattress, a superb shower room with large shower, under floor heating and heated towel rail, a well-equipped kitchen (including single electric oven with grill and hob, electric cooker hood, a microwave, dishwasher and washer/dryer) a dining area leading through to a cosy sitting room with tv/freeview and dvd player and superfast fibre broadband. The cottage has the benefit of gas central heating and a gas stove for those chilly evenings. The cottage nestles in a pretty garden with flower beds and a lawn to the front and a patio complete with garden furniture to enjoy outdoor living on those long warm days. Bretforton is famous for ''The Fleece Inn'' (Country Pub of the year 2016 - The Good Pub Guide) a pub steeped in history, originally built in the early 15th century, and bequeathed to the National Trust in 1977. A vibrant part of the community and popular for good food and real ales, the pub attracts loyal locals and visitors from all over the world. Bretforton Community Shop is just a minute's walk from the cottage and a purveyor of local produce and local fayre. Making the most of your visit - why not plan a day at Cheltenham Races (just 20 minutes away), enjoy an evening at the Royal Shakespeare Theatre, visit one of the Shakespearian properties or wander around the ancient walls of Warwick Castle. For the petrol heads amongst you the British Motor Museum at Gaydon is an absolute must. For those people who just want a relaxing time, there are local National Trust properties and gardens and beautiful Cotswold villages on the doorstep making this the perfect retreat for an enjoyable holiday at any time of year. My partner Phil is a professional wall and floor tiler and was taught carpentry skills by his Father, turning his hand to almost anything. I work in a busy conference venue and have developed needlework and decorating skills over the years. For the last 2 years we have worked tirelessly pooling our resources to fulfil our dream of renovating a cottage to start our holiday let business. Our mission is to make your stay as comfortable, relaxing and as memorable as possible in the hope that you will return in future years. Bear's Cottage has been a restoration project where we have tried to retain as many of the original features and recycle as much as possible. No surface has managed to escape the wallpaper stipper, the sander and the paint brush! From the moment we stepped into the decaying half glazed porch and entered the cottage through the old front door we fell in love with it's charm and knew we could transform Bear's Cottage into a desirable holiday cottage providing a tranquil and relaxing haven. Bear's Cottage typifies the architectural type ''Cotswold Cottage'' sitting in a fantastic location in the Conservation area of Bretforton, a village bustling with activity and a vibrant pub ''The Fleece Inn''. There is always something happening in the village with the pub at the centre of everything, we have our own Silver Band (the only one left in Worcestershire) and frequently have dancing from visiting Morris Dancers. The annual musical festival 'Bret Fest' is an occasion not to miss and is free for everyone to enjoy - holiday makers included! Salt and pepper. Welcome milk, tea, coffee and sugar provided. New kitchen : microwave, ceramic electric hob, cooker hood, single oven, dishwasher, washer/dryer, refrigerator with ice box, kettle and toaster. Flagstone floor in kitchen. Sunny patio to the front of the cottage overlooking the garden with rattan dining/garden furniture to seat 4 people. Garden bench for late evening sunshine in the 'suntrap area of the garden'. Please note : the staircase to the bedrooms whilst reasonably wide with a handrail has a sharp winding turn at the bottom. Regrettably this property is unsuitable for wheelchair users, anyone who has mobility problems or babies/children under the age of 6 years. Welcoming hosts, lovely, warm and comfortable characterful cottage with great facilities. Historical local pub. Easy access to lovely Cotswolds, Warwickshire and Gloucester locations, including villages like Broadway and Chipping Campden. Evesham is lovely with great museum and pretty historical buildings. Towns like Stratford on Avon, Tewkesbury, Gloucester are worth visiting. We also visited the British Motor Museum which is well worth a visit. All in all, a fantastic stay. Thank you very much for such a lovely review of your stay at Bear's Cottage in Bretforton. There is such a lot to do in the area even in the depths of Winter! Both Phil and I are delighted that you had such an enjoyable stay and also hope you enjoyed the rest of your trip - we do hope you return to Bear's Cottage in the future. Very good impression from the off. Fast last minute booking. Handled very well... cottage perfectly clean with all mod cons. Perfectly situated in the heart of the small village. Directly opposite a village shop (rare in small Cotswold villages), and less than a minutes walk to a cracking free house (the fleece). Cottage was spotless and very much an arrive and relax environment. Credit to the owners for renovating the cottage in such good taste. Thank you very much for your lovely review and it was a pleasure having you both to stay over New Year. We are absolutely delighted you enjoyed your time at the cottage and the village and hope you will return again in the future. My wife and I stayed at the cottage for 25 days. We found the cottage to perfectly reflect the written descriptions and the beauty of the village. Our hosts did everything possible to make us comfortable and went well beyond what we had expected. For instance, the cottage was nicely decorated for Christmas and there was holiday bread baked in the kitchen. The fresh flowers and immaculate cleanliness made us smile. The appliances and tidy kitchen made it easy to prepare meals. The bathroom reflects the amenities in a nice hotel with a great shower. The beds were comfortable with nice quality sheets, pillows and duvets. The furnishings are simple but perfectly comfortable. The wifi is super fast and the television has cable stations. We also loved the little village store with fresh backed breads and necessaries. We were also invited to functions of the Bretforton Social Club across the street. We spent our days hiking and exploring the nearby towns and villages. We also went to the Shakespeare Theater in nearby Stratford-upon-Avon. There is also football (soccer) played at every level in nearby cities. We also visited the British Motoring Museum which was a plus. Recommend having a car for this visit ( very easy parking) and enthusiasm to explore. The people of the Midlands are friendly and eager to meet you. The history of the area will overwhelm you. We loved the nearby of Evesham as a place of great history, and many great places to explore. Thank you for such a lovely review Stephen & Beverly, we loved having you to stay in our cottage and from the comments I have received the people of Bretforton Village thoroughly enjoyed having you here too! You looked after our cottage so well and left it spotless .....we are so pleased you enjoyed your holiday and you are welcome back anytime. We loved the cottage. It was very wel equiped . The garden was wonderful and the village was nice and peaceful. We had a lovely stay and wil be back. Thank you very much for your lovely comments. Phil and I are delighted that you had such a lovely stay in our cottage and enjoyed the village - you are the perfect guests. We look forward to welcoming you back to Bear's Cottage in the near future. Great period property. Modern interior. Like home from home.Everything thought of by owners. Great location. Quiet area. Opposite small community shop. Close to local pub (The Fleece). 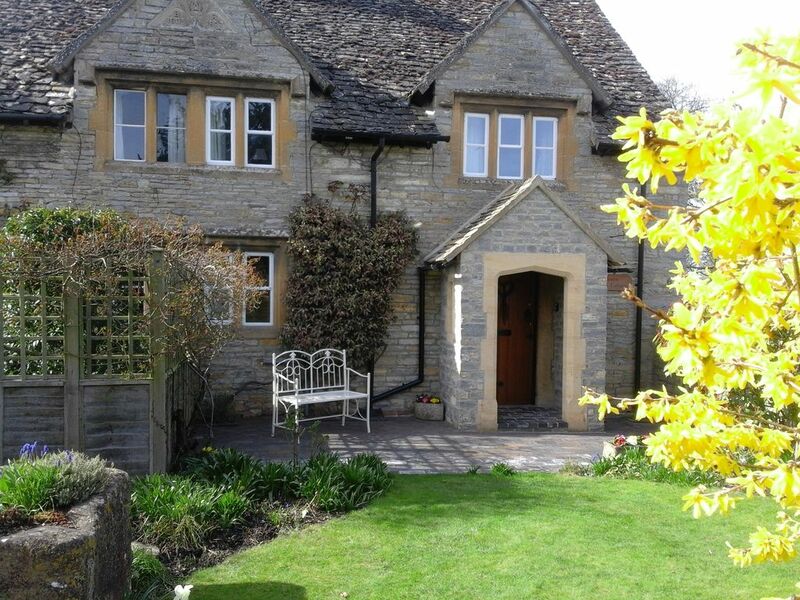 Property is well located for visiting various locations within the Cotswolds. Would highly recommend. Thank you very much for taking the time to write a review of your stay at Bear's Cottage in Bretforton, it is very much appreciated. We are both delighted that you enjoyed your stay at our cottage - the perfect guests .....you are both welcome anytime. OWNERS CANCELLATION POLICY (Please ask the owner or check their rental agreement when booking this property) In the event of a cancellation , refunds of the rental will be made if the Owner is able to re-let the property, but any expenses or losses incurred in doing so will be deducted from the refundable amount. The rental period will commence at 3.00pm on the first day and will finish at 10.00am on the last day. The number of people staying in the property must not be exceed the number confirmed on the booking confirmation invoice. The owners will not be liable for a) any defect or stoppage in supply of public services, nor in respect of any equipment, plant or appliance in the property. b) any loss, damage or injury which is the result of adverse weather conditions beyond the control of the owners. c) any loss,damage or inconvenience caused to or suffered by the Guest if the Property shall be destroyed or damaged before the start of the rental period. Under no circumstances shall the Owner's liability to the Guest exceed the amount paid to the Owner for the rental period.